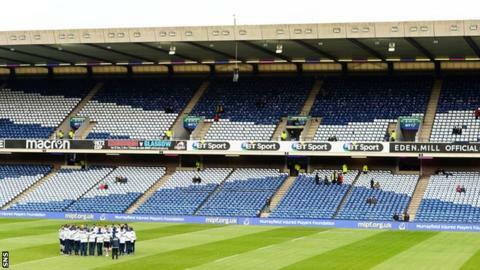 Scottish Rugby has announced record turnover and more than halved its debt over the 2017-18 season. The governing body's turnover rose by £5.8m, or 11%, to £57.2m, generating a surplus of £1.8m. Its debt fell by £2.8m to £2.4m - its lowest average debt since the game turned professional in 1995. In its annual report, Scottish Rugby say this "creates a platform for increasing sums of money to be reinvested into the grassroots game." It adds the "increase in turnover was achieved through strong broadcast revenues of £15.2m and a rise in other operating income to £18.9m in relation to increased commercialisation of the Guinness PRO14, higher match-day hospitality and game-day related sales at BT Murrayfield, non-matchday events and income from British & Irish Lions. "Despite one less Six Nations Championship game last season, ticketing income dropped only slightly to £12.3m as a result of higher average game attendances. Commercial income also recorded a slight fall to £10.8m, reflecting the tough sponsorship market." Scottish Rugby has also reported a 19% rise in the number of women's teams in Scotland to 62. Under Gregor Townsend, the national team recorded home autumn wins over Samoa and Australia last term, while coming close to a maiden win over back-to-back world champions New Zealand. Townsend led Scotland to victories over France, Italy and - for the first time in a decade - England in the Six Nations Championship. Both professional teams, Edinburgh and Glasgow Warriors, reached the play-off stage of the inaugural Pro14 league, while the national women's team finished their Six Nations campaign with a solitary victory from five matches - their first-ever over Ireland. Domestically, Scottish Rugby says it is committed to continuing and fully funding itself the Club Sustainability Fund, which has been partially paid for by principal sponsors BT. The fund has contributed money to 167 clubs in Scotland. Scottish Rugby chief executive, Mark Dodson, said: "Rugby in Scotland is enjoying a resurgence at international and professional level and the support for these teams has never been stronger. This has contributed to the strong financial position we can report this year, which will help us to continue to move the game forward at all levels. "We are committing record levels of investment into the grassroots game in Scotland in order to create a sustainable environment and help improve the standards of rugby being played across the board."